Much of the land east of the Cascade Mountains is arid, either high desert or pine forest. While irrigation has allowed eastern Washington State to become one of the most fertile growing regions in the world, the region's natural foliage includes a whole lot of sagebrush. Cities just east of the mountains benefit from the rain shadow effect, which blocks rain-producing weather systems and allows for a higher number of sunny days. As you head east, the rain shadow impact diminishes - the Idaho-border city of Spokane gets twice as much annual rainfall as Ellensburg, a town that sits just east of the Cascades. The inverse tends to be true when it comes to snowfall in Eastern Washington, where the regions closer to the mountains or at higher elevations get significantly more snow. 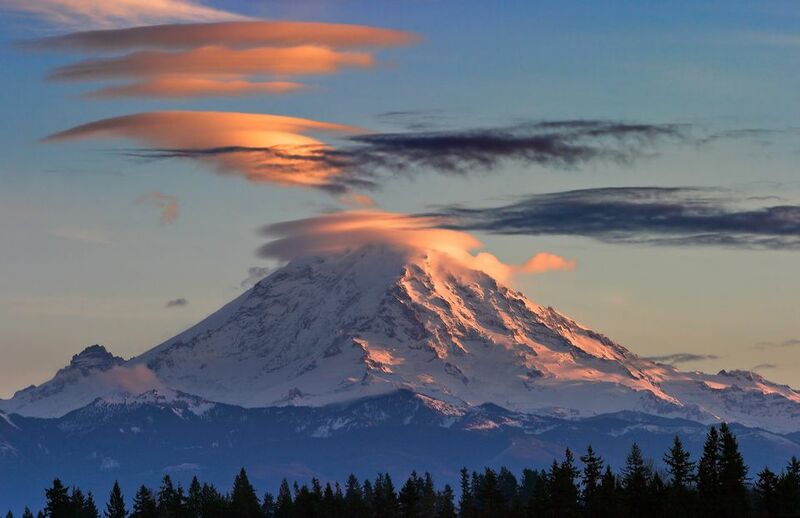 The topography and the large bodies of water create incredibly varied and often dynamic weather conditions in the western section of Washington State. Western Washington's topography is quite complex, with the relatively-young Olympic Mountain Range occupying the Olympic Peninsula. The sea-level cities along the east side of the Puget Sound transition quickly to the foothills of the Cascade Mountain Range, which runs the entire north-south length of the state. The Pacific Ocean, which extends into the more sheltered Puget Sound, both moderates the temperature and adds moisture to the local climate. Rain tends to get squeezed out of the clouds on the west side of both the Olympic and the Cascade Mountains. Cities west and southwest of the Olympic Mountain Range, such as Forks and Quinault, are among the rainiest in the United States. Cities on the east and northeast side of the Olympics are in the rain shadow and are consequently among the sunnier and drier locales of Western Washington. The most populated area, which extends from Olympia to Bellingham along the east side of Puget Sound, is also impacted by varied weather conditions. Whidbey Island and Bellingham, which face the Strait of Juan de Fuca, tend to be much windier than most of Western Washington State. The Olympic Mountain Range splits the airflow coming off the Pacific Ocean. The point where the flow converges again, typically in the North Seattle to Everett area, tends to have extremely dynamic weather that can vary significantly from that just a few miles south. This region is called the "convergence zone," a term you'll often hear in Western Washington weather forecasts. Spring in Washington State means different things in different areas. In the Western part of the state, temperatures increase, and there's less rain. However, rainy season continues through the middle of June. Additionally, light snow is still possible in some areas as late as March. If you're along the coast, spring temperatures can feel quite cold due to oceanic breezes. In general, coastal locations will be cool. March is also the beginning of the whale-watching season. What to Pack: Spring weather is variable and unpredictable. You should pack lots of layers that will keep you warm and dry in case of rain or a late-season snowshower. Even the warmest spring days can have cool evenings. By June, Washington's weather begins to improve, as temperatures climb to the high-60s (20 C). Rain is not a factor during the summer months, with an average of just 1.2 inches per month during the summer. Most days are warm and sunny. The weather is perfect for the many outdoor activities that the state has to offer, ranging from hiking and fishing to merely sightseeing. The Western side of the Cascade Mountains has incredible natural beauty with abundant lush greenery and other natural attractions. What to Pack: Washington is rarely so hot that a pair of light pants will be uncomfortable, so you can pack according to your own comfort level during the summer months. Some days will still be quite cold, so a jacket or sweater (hoodies are also popular) is a good thing to bring with you. The great weather continues into fall—outdoorsy visitors should take advantage and enjoy the fantastic hiking, biking, and boating that Washington has to offer. Fall's temperatures are similar to summer, but you have the added natural beauty of the change seasons. Contrary to what most visitors believe, early fall is mostly sunny and dry; the average rainfall in September is just under two inches. By October, temperatures drop slightly, averaging around 50 degrees Fahrenheit (10 C) and rains increase significantly (to six inches) come November. The rains increase throughout the fall, a trend that continues into winter. Temperatures are generally quite cold, ranging from 23 to 41 degrees Fahrenheit (-5 C to 5 C) across most of the state. While Washington does receive snow, the majority of the state's precipitation is in the form of light showers or drizzle. In the mountain, ski season begins in late November and runs through April, or sometimes even May. What to Pack: During winter, you'll undoubtedly experience chilly temperatures and rain so be prepared. Pack a waterproof or water-resistant winter coat and shoes that can withstand rain. You'll also want winter accessories, like a warm scarf, gloves, and a hat.